Don’t bother trying Rapid Tone weight loss pill because it is a scam! In this review you’ll find out all you need to know about this product, and all the reasons why you should stay away from this product and warn others about it. 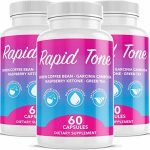 Rapid Tone claims to have ‘sparked a weight loss revolution’ by basically including such ingredients as green tea extract to their formula. The scammers also claim that their product is made in the USA ‘in an FDA registered and GMP certified facility.’ Well we’ll see about that. These ingredients have been linked to weight loss because of their various positive effects on body metabolism. So their use in weight loss is not an issue. However, experience has taught me that scammers love using these substances as a perfect cover to sell their fraudulent products. So these ingredients don’t convince me one bit. Here’s why. There’s no information about the manufacturers of Rapid Tone weight loss pill. There’s no physical address, their website domain registration info is hidden … and we don’t even know the name of the company behind the product. The only thing we’re given is a phone number and email address. This is a serious problem because should any problem arise, they will be no one to hold accountable. The company behind this product is basically anonymous. We’re essentially dealing with a ghost company who desperately want to hide their identity. Rapid Tone Weight Loss Pill has one of the most contradictory and problematic Terms and Conditions I’ve seen so far. Given that many people don’t bother reading this page because of how long and boring it is, these scammers figured that they can lie to you on their website while hiding their true colors in this rarely visited page. Unfortunately for them, Contra Health Scam likes reading Terms and Conditions pages! On their website, we’re told that Rapid Weight Loss Pill has a risk free, 30-day moneyback guarantee. But their Terms and Conditions tells a different story. Check out the screenshot below, taken from their Terms and Conditions page. The funny part is that above this paragraph is a section addressing how to get your refund within 30 days of purchase. Talk about dishonesty and talking from both sides of the mouth! Do a quick Google search, and you’ll be inundated with positive reviews and testimonials about Rapid Tone Weight Loss Pill. Even Amazon has a significant number of these positive reviews and at a point, I thought that maybe, they are genuine since most of them were verified purchases. But being a meticulous person I am, I decided to look at their Facebook page … and the reviews there are bad. Really bad. Complaints range from shady billing, late delivery of purchased products (one reviewer reported receiving his order 20 days into the 30-day moneyback guarantee), the product not working and the sellers not issuing refunds. So it’s safe to say that this product is no good. Stay away from it! Final Conclusion: DON’T BUY Rapid Tone Weight Loss Pill. It is A SCAM! If you’ve made the mistake of buying this product, you can always file a credit card dispute with your bank to have the payment reversed. You can try calling up the number provided on the website but I’m pretty certain that they will not honor their own refund policy. So it’s best to work with your credit card company on this one. 1. Trim Down Club. For just $1.99, you’ll get access to a fantastic weight loss program complete with a community of nutrition experts and people on the same weight loss journey. I highly recommend this program so you can either join now or read my review for more details. 2. Eat Stop Eat. This innovative weight loss program by nutrition and fitness expert has consistently proven over the years to be an authentic weight loss program that works. The program is all about losing weight through intermittent fasting. Get the program now or read my review for more details. There are also more weight loss programs I recommend. You can check them out in the Whitelist or immediately below this review. These programs are legit and will honor their refund policy should you decide their program isn’t for you. So don’t be afraid to check them out.